The opening of the Roots of Racism Show took place on Friday, Sept. 8th, 2000 at the Vertigo Studios in Memphis TN. Many of the quilters who had works on display were in attendance as well as others. We wanted to share with you some of the pictures taken of the quilts and attendees in a quick web site so you could celebrate too. 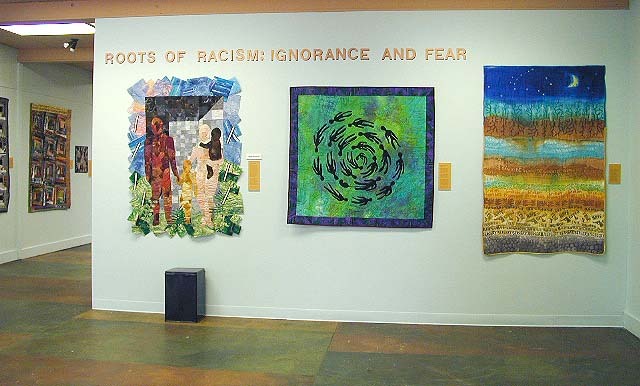 Celebrate with us the bold statement that this collection of quilts makes against racism and its effects. Help spread the word that the dream of a world without racism is still alive and that there are many still fighting the fight. Announcing -- The Winners! and our sponsors! NEW! Take the gallery tour of all the quilts!